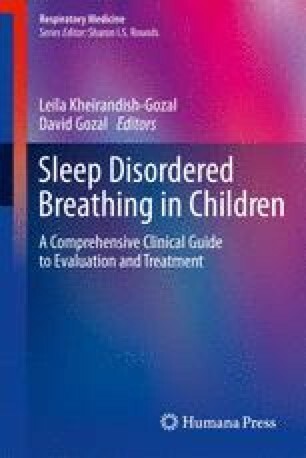 Pediatric sleep-disordered breathing (SDB) is associated with a wide range of emotional and behavioral symptoms. Despite high prevalence rates, symptoms of SDB and potential SDB contributions to behavioral difficulties are often over-looked. During the past several years, case series, cross-sectional studies, and meta-analyses have suggested higher frequencies of SDB in children who are also diagnosed with disruptive behavior disorders such as attention deficit hyperactivity disorder. Conversely, children with objectively defined SDB exhibit higher frequencies of these disorders or related symptoms. The precise neuroanatomic mechanisms of these associations are not clear; however, we here provide a neuroanatomic model that attempts to synthesize the links between sleep problems, associated neurophysiological disruption, and observed behavioral difficulties. We propose that repeated sleep fragmentation due to ­frequent respiratory-related arousals, as well as hypoxemia are likely to impede normal development of the frontal-subcortical circuits implicated in disruptive behavioral disorders. In addition, considerations for assessment and treatment are provided through a case example. Recommendations for future directions highlight the need to clarify optimal polysomnographic definitions for pediatric SDB and to develop more sensitive ­methods that better predict neurobehavioral consequences.